Odds-on favourite Sire De Grugy ended his excellent season with a fifth straight win, in the Celebration Chase at Sandown on Saturday. The horse, ridden by Jamie Moore for trainer father Gary, won by three-and-a-quarter lengths from Pepite Rose. It was a sixth win, and fourth Grade One, from seven races in a season which saw victory in the Champion Chase. Meanwhile Barry Geraghty won the Bet365 Gold Cup on Hadrian's Approach, denying the AP McCoy-ridden Burton Port. Geraghty, who won his maiden Irish Grand National five days earlier on Shutthefrontfdoor, was landing the race for the first time aboard the Nicky Henderson-trained chaser (10-1_. 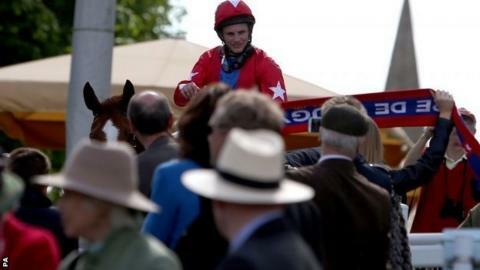 McCoy, who was crowned champion jockey for the 19th successive time at Sandown, did win earlier in the day. The Northern Irishman was victorious with 14-1 shot Dispour, trained by Donald McCain, in the opening handicap hurdle. Sire De Grugy, originally bought as a 50th birthday present for his owner Sean Preston, was voted horse of the year in a poll leading up to the jump racing season's final day and delighted his supporters again. "It shows what a great horse he is to win four Grade One chases in a season," said trainer Moore.